It's unfortunate that most young people are unaware of the legacy of Lyndon B. Johnson with his Great Society legislation, Head Start, Medicare and Medicaid as well as his escalation of the Vietnam War and most importantly the Civil Rights Bill. Johnson was an old school southern politician when he was the Senate Majority Leader. He was smart, savvy, and knew how to maneuver the various factions of Congress. It was because of his influence that he was tapped by John F. Kennedy to be his vice president. This is despite the objections of JFK's brother, Robert Kennedy, who thought LBJ was too stuck in his ways and not ready for the new vision ushered in by JFK. Even LBJ, who highly respected Kennedy, felt his good looks and charisma outshone the old white southern boy from Texas. Woody Harrelson (in thick pasty makeup) looks close enough although he's not as tall. He's got the drawl and harsh language that LBJ used to get things done while in office. Directed by Rob Reiner from a script Joey Hartstone which was on the 2014 Black List of scripts that were most promising, meanders the story from LBJ's work before his presidency, to the fateful day in Dallas, to what he has to do to appease the Southern Caucus who think they finally got one of their own in power. Robert Kennedy (Michael Stahl-David) wanted to impede Johnson't influence while he was JFK's second in command. JFK (Jeffrey Donovan, who got down the signature eye crinkle and smile), lets his brother keep a close eye on Johnson, and lets him be isolated. Jennifer Jason Lee is a remarkable double for Lady Bird Johnson, who supports her husbands' moments of insecurity by reminding him that this is what he wanted. Everyone is familiar with the assassination that propelled LBJ to become the 36th President of the United States. LBJ, wife and Jackie Kennedy huddle on Air Force One while he is sworn in as president. He seems stunned and overwhelmed in grief, but quickly takes charge of the staff and secret service who seem just as stuck in place. 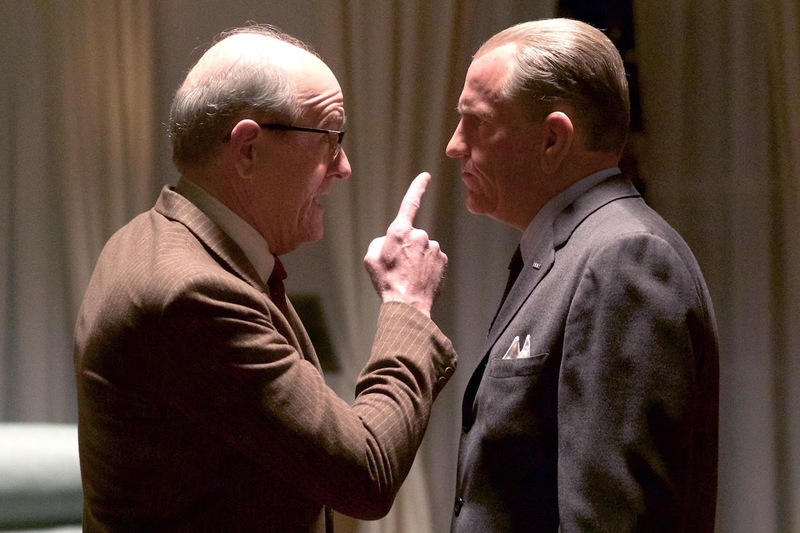 Senator Richard Russell (Richard Jenkins), a close colleague of Johnson, thinks that now it's assured that the Civil Rights agenda that was supported by Kennedy will not progress. That their southern way of life will be forever kept in place. Johnson recalls how their African American maid who he considers part of the family has difficulty going out in the world ever wary of the looks and comments in her wake. Johnson doesn't think anyone has to endure this kind of prejudice. Considering the present state of the world with each factions digging in to their personal righteousness, it's fitting that the man who was able to support JFK's agenda and change the world. We don't really get that much of an insight to LBJ but we do get a satisfying bump when he calls his mentor Senator Russell a racist.